It's finally happened: You've been trying to sell your home for weeks. An offer comes in and you accept it. You and the buyers sign a contract. You're now on your way to a closed sale, right? Not necessarily. Home sales can fall through, and it's something that's been happening more frequently: Trulia reported that 3.9 percent of home sales fell through last year, up from 2.1 percent a year earlier. Those numbers indicate that most home sales do eventually close after the buyers and sellers agree on a price and sign a contract, but what about the nearly 4 percent that didn't? What kept those sales from closing? Most buyers today will order an inspection of a home after they sign a contract and before they sign the closing papers that give them ownership of the residence. The home inspector tours the property, looking for problems big and small. It's the big problems that can scuttle a sale. When inspectors turn up major problems — such as leaky roofs or sagging foundations — buyers will ask for relief from sellers. Sellers can agree to hire contractors to fix the problems themselves, reduce the selling price of the home, or provide buyers with a credit so that they can fix the issues. 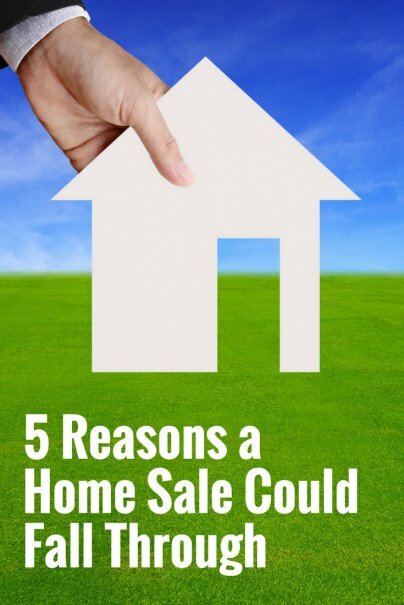 But if sellers refuse to do this, buyers can cancel the home sale. Buyers might lose the earnest money deposit they made when signing their contract, but the home sale will fall through. Most buyers will take out a mortgage loan to buy a home. When they do so, their lender will require them to pay for an appraisal of the residence. Problems arise when the appraisal comes in significantly less than the agreed-upon sales price. Say you and the buyer agree on a final price of $250,000, but the appraisal ordered by the buyer comes in at just $180,000. The odds are high that the buyer's lender won't provide a loan that is so much higher than this appraised value. Sellers could reduce their price. Or buyers could bring enough cash to the table to bridge the difference. But if this doesn't happen, the sale will most likely fall through. You and a buyer might have agreed on a final price and signed a contract to sell your home. But what if that buyer is rejected for a mortgage loan? When buyers can't qualify for mortgages, home sales are scuttled. That's why it's best to accept offers from buyers who are already preapproved for mortgages. These buyers are more likely to get the financing they need to close a home sale. Buyers sometimes suffer immediate remorse after signing a contract to purchase a home. Sometimes that remorse passes. Other times, it's so strong that the buyers back out of their purchase. Sellers do have some protection here. If buyers simply change their minds after signing a purchase contract, they will usually lose their earnest money deposit. That deposit — made when buyers sign a purchase contract — is typically 1 percent of a home's final sale price. Unless there are extenuating circumstances, such as problems uncovered in the home inspection, sellers will typically keep that money if the buyers walk away from the deal. Buyers often must sell a home before they can officially buy yours. That's because most people can't afford two mortgage payments at once. These buyers will make what are known as contingent offers: Their purchase of a home won't close until they can first sell their own residence. Typically, a contingent offer will give buyers a set number of days to sell their homes, often 30. If buyers can't sell their own homes during this time, their offer to buy your home will fall through.